The Metropolitan Museum of Manila announces an open call for the MET Open 2014, a curated benefit exhibition that will showcase artworks that best represent contemporary Filipino art. MET Open 2014 endeavours to discover new creations that take various forms extending our visual experience of the society we live in today. This exhibit is slated from September 15 till September 27, 2014. The MET is accepting entries from artists regardless of training, nationality or age, residing in or who may have resided in the Philippines for an extended period. Interested parties should initially submit information and images through the MET Open website. 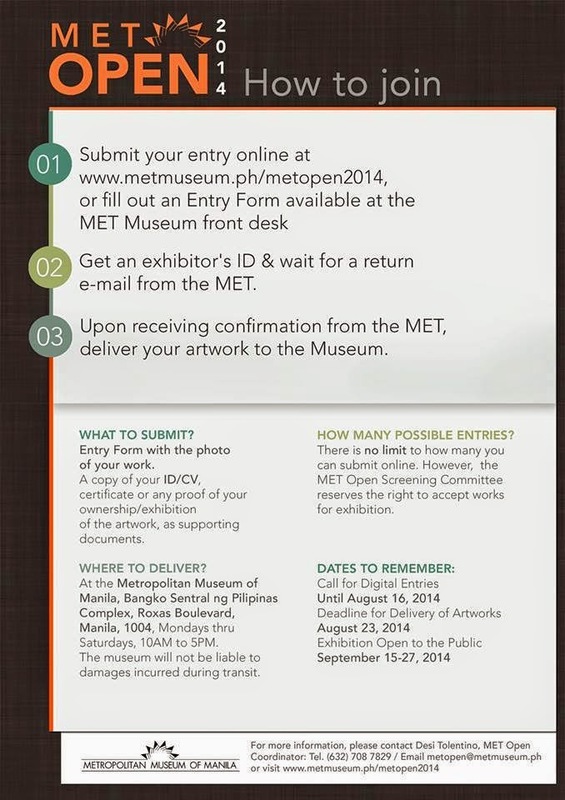 Entry forms and guidelines are available online at http://metmuseum.ph/metopen2014. Deadline for submission of completed entry forms is on August 16, 2014. The Metropolitan Museum of Manila is located at the Bangko Sentral ng Pilipinas Complex, Roxas Bldv., Metro Manila. The museum is open from Mondays-Saturdays, 10 AM- 5:30 PM. For inquiries about the MET Open, you may email Desi Tolentino at metopen@metmuseu.ph or call (02) 708-7829.